The Brawler's fixin' to start his Christmas trav'lin', which is to say he'll be off the grid for a while. And as he drives the Brawler family over the open road, the Brawler no doubt will ruminate on one of his favorite Christmas stories: The Christmas Truce of 1914. Short story: For at least one day -- and in some cases for a bit longer -- the Germans and Allies stopped shooting each other on the Western Front and instead exchanged gifts. Maybe even played soccer. Today, pragmatists read the Truce as nothing more than a 'blip' – a temporary lull induced by the season of goodwill, but willingly exploited by both sides to better their defences and eye out one another's positions. Romantics assert that the Truce was an effort by normal men to bring about an end to the slaughter. All of which is to say, happy holidays to all -- and that means you Patrick McIlheran. So saith the National Review's resident Simpsons expert Jonah Goldberg in his long-long-long awaited epic Liberal Fascism. 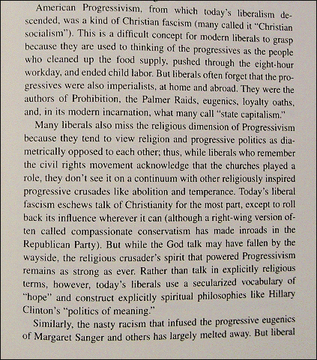 Specifically, Goldberg identifies the Progressive movement as a sort of "Christian fascism." Who knew food purity laws or curbs on child labor were fascist? Sadly No! has been doing yeoman's work in blogging this dreadful tome page by page. The Brawler eagerly awaits Patrick "liberals are on a continuum with the Nazis" McIlheran's incisive review of Liberal Fascism! Update: Misspelling in headline corrected! Is Jessica McBride an ethical journalist? OK, so that was a rhetorical question. When will Jessica admit that she is not a faculty member at UW-M? Brawler unfairly picking on Journal Sentinel's McIlheran? Rick Esenberg takes exception to a recent post in which the Brawler castigates Patrick McIlheran for saying Adolf Hitler was a leftist. 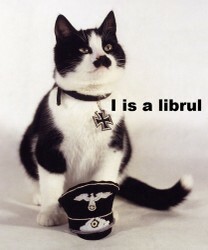 The title of that post is, of course, "Journal-Sentinel's McIlheran: Hitler was a liberal!" The Brew City Brawler is up in Patrick McIlheran's face for supposedly suggesting that Hitler was a "liberal," He burns down that straw man but can't quite avoid the temptation to say that, no, Hitler was sort of like an American conservative. Of course, this doesn't mean that he was anything like an American liberal and Patrick made no such claim. Patrick's point was that some people us the term "right" to refer to anything they don't like. Now, Patrick's "point" was fairly silly in the first place, as the Brawler explained here. Hitler, of course, is regarded as right wing though the party he headed was the National Socialists and, as is now being pointed out, built a welfare state to make any socialist proud. Those on the left in America tend to favor a stronger government that has a more central role in society. Communists do so, too, only to an enormous degree. Those on the right in America tend to favor a more limited government and prefer its role in society be subsidiary to voluntary institutions, such faith or families. Nazi ideals held nothing of the sort, instead seeing such voluntary institutions as utterly at the service to the nation itself as embodied in the state. There is no continuum as there is on the left. To the best of my observation, the more ideological someone is about his leftism, the more totalitarian and anti-American are his views. The more ideological someone is about his rightism, the more likely he is to want to privatize the traffic lights and to carry a picture of Ayn Rand in his wallet. The one tendency produces people who want an unusually and arguably unrealistically low level of government. The other tendency produces people who make excuses for thugs like Castro. So, apart from saying that "the left in America" (and the Brawler would say a fair translation of that phrase is "liberals") is on a continuum with the Nazis and that the "more ideological someone is about his leftism, the more totalitaritarian and anti-American are his views," McIlheran made no claim that Hitler was "anything like an American liberal." Sorry, but the Brawler's sticking with his headline. Moreover, the Brawler emphatically did not say Hitler was sort of like an American conservative. The Brawler did say this, apropos of a passage he was quoting from Richard J. Evans' "The Third Reich in Power." So...American conservatives have never criticized social programs for being bureaucratic and cumbersome? I didn't say that made conservatives Nazis. Those sorts of critiques precede the Nazis by decades -- and they've been made by leftists as well, for Pete's sake. (Part of the Nazis' broader critique was race-based -- ie the programs helped the Jews -- and obviously I was not drawing any parallels in this area at all.) Indeed, the Brawler used an exclamation point to suggest he was being facetious and not intending to be overly serious. Were the Brawler serious, rest assured, paragraph after paragraph of platitudinous whinging would have ensued. If the Brawler's intent was not obvious, he apologizes. The Brawler did also point out that while American's rightists allegedly support limited government, it's difficult to tell given their -- and McIlheran's -- support for things that most people would not construe as being symptomatic of a limited government. The endless and expensive occupation of Iraq. The Patriot Act. The Bush Administration's effort to push black voters off the rolls. The Bush Administration's use of signing statements. And so on. I didn't say that this curious disconnect made American conservatives something like Nazis. And, has been noted elsewhere, for all the talk of how it's leftists that call the conservatives Nazis, there's never been any shortage of rightists doing the opposite. Rush Limbaugh's charming word "feminazis" comes to mind. The National Review's Jonah Goldberg is coming out with the much-delayed and -derided tome Liberal Fascism in a matter of weeks. "No socialist system can be established without a political police. They would have to fall back on some form of Gestapo, no doubt very humanely directed in the first instance." Hitler did not allow free-market capitalism. Hitler spent any monies he saw fit, for any purposes he saw fit. Liberals like to believe that Hitler and Mousolini were "right wingers". What they mean is that THEY view anyone who is not LIBERAL, as a TOTALITARIAN WHO WANTS TO ENFORCE CONSERVATIVE VALUES BY GOVERMENT FIAT. Liberals believe that THEY are GOOD, and that THEIR AIMS are GOOD. Liberals believe that because THEY ARE and THEIR GOALS ARE....good/pure, that THEY have a MORAL MANDATE to act. They have decided that their goals are GOOD. THEY HAVE decided that anyone who disagrees is a RED NECK or FASCIST, and thereby not allowed to disagree. The MSM basically follows the aforementioned template. It becomes FACT and is DISEMINATED in Schools, the Media, and is accepted as FACT, by the liberal power structure. Most/nearly ALL of those who rely on GOVERNMENT for their paycheck, AGREE. Recently, I had a gubmint employee tell me that her employemnt and benefits were justified, because, WE ALL MAKE CHOICES. What liberals fail to consider is that, IF WE ALL MADE LIBERAL CHOICES, no one would be left to pay the bills and the MASSIVE government hand-outs, that liberals approve of. In other words, liberals, and socialists, approve of spending, funding and paying for programs, that THEY DON'T PAY FOR. Journal-Sentinel's McIlheran: Hitler was a liberal! it seems odd that someone would say Hitler was a leftist, don't it? But that's exactly the claim made by Patrick McIlheran, the Milwaukee Journal-Sentinel's resident right-wing columnist. So let's see: Those on the left in Wisconsin favor increased government funding for the support of autistic children. Nazis would use a strong central state apparatus to round up and intern or execute those children as unfit or as "useless eaters." One group wants the government to help kids. One want the government to kill the kids. Both want to use the government. Don't you see the continuum? But let's dig a little deeper. First off, the "welfare state" in Germany predated the Nazis. Indeed, it was none other than Otto von Bismarck that got the ball rolling in the late 19th century with social insurance to take away an issue from the socialists. I suppose that would make the Iron Chancellor a leftist as well. So, yes, the Nazis created social welfare programs (including the Winter Relief, in which Brownshirts went door-to-door collecting "donations"). But these were politically driven -- politically necessary -- not ideologically driven. As Evans discusses, the Nazis actually cut benefits, drove agencies to relentlessly question the unemployed as to whether they were fit for work, cut rent supplements, cut payments to those caring for the old and cut payments for medicine. Truly a welfare state that would make a socialist proud! That's totally Hitllary's secret plan, isn't it Paddy? As for that "National Socialists" name -- it was a rhetorical flourish to attract industrial workers in the party's early years, before Hitler was involved. In a different context, McIlheran has said that calling someone a Nazi is a sign that you're losing an argument. Yet he has no difficulty making the absurd case -- based on ill-conceived logic, moral obtuseness, and ignorance or outright distortion of history -- that there is some sort of "continuum" between Nazis and 21st century liberals. It's a contemptible exercise and Paddy ought to be ashamed of himself. The American left sees an activist role for the state -- but so does the American right. The Brawler seems to recall McIlheran praising a court decision in which a woman has to pay hundreds of thousands for illegally downloading songs. That apparently is limited government. But if government is activist on the behalf of business, that apparently is OK. The last the Brawler checked it wasn't the left that is supporting a war based on lies (and isn't war, in the end, the most fearsome power of the state?) or enabling an administration that is increasingly secretive, flouts the role of Congress through signing statements, actively seeks to throw blacks off the voter rolls, eavesdrops on its citizen and commits a legion of acts that would offend the ideal conservative held out by McIlheran. It's conservatives. And it's McIlheran. The Lolcat at the top was lifted from here. Jessica McBride isn't a UW-M faculty member. Why is she lying? Over at the Brawler's pied-a-terre, Whallah!, he pointed out last night that while Jessica McBride claims to be a faculty member at UW-Milwaukee, she isn't. She's part of the instructional academic staff. Not that there's anything wrong with that. But it ain't faculty. She knows. Googling shows that she's a member of a committee called the Academic Staff Legislative Subcommittee. Ooh, resume gilding! It's an evergreen. As a seasoned journalism...lecturer...she knows that those stories are always trotted out to bring down, say, city administrators or chiefs of police. It's 11:37 in the PM, roughly 24 hours since the Brawler laboriously pointed out McBride's misrepresentation. She has yet to correct the record. She really should. Can the Journal-Sentinel's Patrick McIlheran read? Let's not forget the deteriorating situation in Afghanistan. The Taliban is regrouping and gaining an ever increasing foothold in the southern provinces. The fact that we didn't finish this job like we should have 5 years ago is also conveniently forgotten by conservative pundits. You mean deteriorating, Mr Bigcat, in the sense that the Afghan army, with help from U.S. and British forces, retakes the only Taliban-held town in the country? To be sure, NATO commanders in Afghanistan say they're short of troops at times and in places ... (it dribbles off into a series of non sequiturs and evasions trying to pass as withering insight). But beyond demonstrating the progress made by the Afghan army and the psychological boost from recapturing a town previously lost, security analysts say Musa Qala, in the north of the desert province, has little strategic value and its capture does not affect the Taliban's ability to launch guerrilla strikes. As if to demonstrate that point, the Taliban counter-attacked near Sangin, further south in Helmand, a town captured by British forces in April in an offensive to relieve British troops under siege in the town hall there for more than nine months. "After fleeing Musa Qala the insurgents wanted to put pressure on Sangin district ... during 48 hours of fierce fighting, Afghan troops killed more than 50 terrorists," the Defence Ministry said. "Among the enemy casualties, there were three foreign fighters and we have also killed three Taliban commanders ... NATO also used air power during the operation," it said. Taliban insurgents have launched more than 140 suicide attacks this year in a campaign to demonstrate to Afghans that their pro-Western government and international forces are incapable of bringing security to the country. Would anyone with basic comprehension skills read that and sneeringly suggest we're winning in Afghanistan? Would anyone with basic comprehension skills read a passage saying a troop shortage makes it "hard to consolidate military victories and bring security to government-controlled areas" -- and prevent suicide attacks killing civilians -- and translate it as "To be sure, NATO commanders ins Afghanistan say they're short of troops at times and in places"? After reading this, it's easier to understand why McIlheran thinks we're winning in Iraq. Spot the bias here: Dan Bice’s Sunday column on U.S. Attorney Steven Biskupic claimed that “His office also drew national attention for its poor record in voter fraud cases.” No one has ever proven Biskupic didn’t prosecute voter fraud vigorously and fairly. Rather, some people in the Bush administration wanted him to put away more people (but even they gave up that idea). The Brawler disagrees with Murphy's use of the word "fairly" (remember Cynthia Alicea!). But Murphy is 100 percent to call out this formulation by Bice. Bice, some longtime Brawler readers may recall, fingered a top state Repub for whining to the White House about Biskupic only a month or so after the Brawler ID'd him as a likely suspect. Did the WPRI poll Hispanics for its illegal immigrant benefit survey? The Wisconsin Policy Research Institute, the state's leading right wing "thank tank," published a survey claiming that vast majorities of Wisconsinites opposed illegal immigrants getting drivers licenses and receiving in-state tuition at UW. Folks were narrowly split on the question of whether illegal immigrant children should be allowed to attend public schools. For what it's worth, 62% of Republicans oppose this idea. The survey, clearly designed to create wedge issues for a desperate GOP as it heads into a dark 2008, can be seen here. The Brawler's big question, after looking at the survey, was: Did the WPRI interview any Hispanics? Because while the survey breaks out how whites, blacks, men, women, Republicans, Democrats. liberals and conservatives in a variety of cities responded, the survey findings elide the reaction of one significant group: Hispanics. WPRI saw fit not to interview Hispanics. This would, of course, invalidate the entire survey. The Brawler would not put this past the WPRI. WPRI did not disclose how Hispanics responded because they did not like how Hispanics responded. The Brawler suspects that Hispanics might -- stress "might" -- have less of a problem with illegal immigrants getting drivers licenses, receiving in-state tuition at UW or educating their kids at public schools. The data could be used as a motivator for pro-immigrant groups. The data could inform politicians that an increasingly influential group of voters, i.e. Hispanics, are more liberal on immigration issues than the majority. This might encourage politicians with an eye to the future. or politicians in districts with growing Hispanic populations, to to moderate their views. Not good for the GOP! If the data shows that Hispanics split from the majority on this issue, Republicans can't realistically oppose bennies in the name of speaking for the majority and at the same time reach out to Hispanics. Who already are bailing on the party as it kowtows to its nativist wing. The right wing jabberers could pick up the Hispanic reaction and use it as an excuse to tee off on Hispanics, regardless of origin or place of birth. Can't you just hear Texas Hold Em Blogger complain about "chihuahuas" who want to jam their culture and language down or throat while they're sucking up our bennies? Actions like this make Republicans look bad -- and WPRI realizes this. Or it could be something else. The Brawler confesses he's not omniscient. That's why the WPRI needs to fess up as to whether it interviewed Hispanics for this survey. Because there's absolutely zero evidence that it did. As one might expect for an essay that manages to describe both Hitler and Stalin as leftists, there's a great deal of sloppy, reductionist thinking in Milwaukee Journal-Sentinel conservative columnist Patrick McIlheran's recent blog post "Right-wingers, such as Stalin." And Stalin was, most definitely, left-wing. He defined left-wing for a whole Depression-era generation of American leftists, in fact. Intimating that Stalin was some sort of lodestar for all or even most Depression-era leftists -- that they woke up wondering WWJSD? -- is a nice smear against women and men of the time. And it's a nice way to take shots at the heritage of today's "leftists." And crying "Stalinism" or "Bolshevism" is always a good way to demonize supposedly left-of-center ideas such as national health care. Sadly for McIlheran, his claim has little basis in fact. To be sure, there was a Communist Party in the United States during the Depression. And a fair number of intellectuals, writers and artists were members or fellow travelers (John Dos Passos, Sherwood Anderson, Edmund Wilson and Langston Hughes among them). As were a distinct minority of influential and effective labor leaders (and CP-leaning unions ultimately were booted out of the CIO). But to say Stalin "defined left-wing for a whole Depression-era generation of American leftists" overlooks the fact that most U.S. leftists of the time were not Communists of any stripe, neither CPUSA nor anti-Stalin Trotskyists. Consider these numbers, courtesy of David M. Kennedy's "Freedom from Fear: The American People in Depression and War 1929-1945" (pp.222-223). The CPUSA had fewer than 30,000 members in 1934, 60 percent of them foreign-born. Fully a third of them were in New York City. CPUSA presidential candidate William Z. Foster netted 102,000 votes in 1932 -- the party's electoral peak. That same year, Norman Thomas received 884,000 votes as the candidate of the Socialist Party (which was not a member of the Moscow-directed Third International), a party that was a shadow of its former self under Eugene V. Debs. Patrick McIlheran can say Stalin "defined left-wing for a whole Depression-era generation of American leftists" when the party that spoke for the USSR netted less an eighth of the votes given the Socialist candidate. But it's all right if we laugh at him. But though they made some inroads among industrial workers, raised some hell in the streets, and fought, often courageously, for the rights of black Americans, the American Communists remained a samll and isolated group. ... After five years of depression, and with millions still unemployed, that number testified bluntly to the great distance that separated Communist doctrine and tactics from American political reality. Who defined the left for a "Depression-era leftist"? Hard to say, as it's not clear how McIlheran is defining the term. As for who defined the possibilities of left politics for most Depression-era Americans, the Brawler would nominate the likes of FDR or John Lewis or Walter Reuther or A. Philip Randolph.